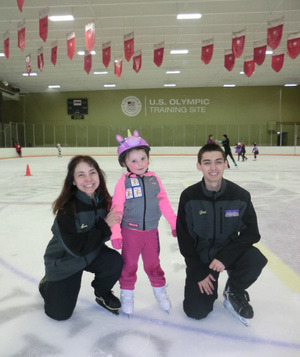 This is a recommended practice plan for those new to ice skating. I put it together since I know it is hard for those new to the sport to know what to practice. 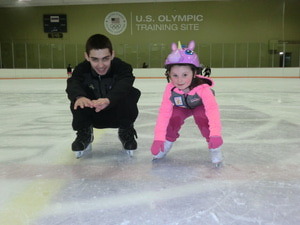 The main thing to remember when you go ice skating is to have fun. Don’t forget your gloves or mittens and a light sweater or jacket. 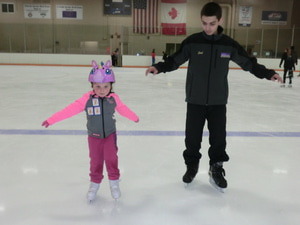 No one wants to fall while ice skating, but if you are going to skate, you are going to fall. So, it is best to practice falling as soon as you get on the ice. By doing so, you will find you are better prepared and you will be more confident on the ice. Bend your knees and squat into dip position. Fall to the side and lean a bit forward as you fall down. Turn over on your hands and knees. Take one foot and place it between your hands. Then take the other foot and place it between your hands. Push yourself up and you should be standing. March or step across the ice and then “rest.” Glide forward for a short distance on two feet. Repeat. Bend your knees slightly and stay in control. In a dip a skater squats down as far as possible. The arms and rear should be level. This is a great exercise to get the knees going. First, practice doing a dip from a standstill. Once you feel comfortable gliding forward on two feet, practice dips while moving. 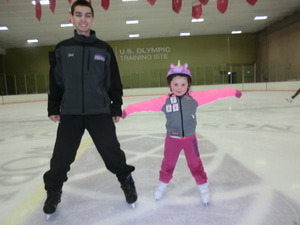 After mastering falling down and getting up, it is now time to skate forward on the ice. Now, do short “scooter” steps with one foot at a time. Pretend you are riding a scooter down the street. Arms can be kept in front on “imaginary scooter bars” for balance. Next, do alternating “scooter” steps. Take a step onto the right foot, rest on two feet, and then step onto the left foot. 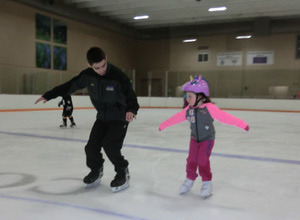 Try pushing from one foot to the other, and skate around the rink. Push your feet apart and use the flat of the blade to make a bit of snow on the ice and do a snowplow stop. Push one foot out by pressing on a flat. There should be some friction on the ice and snow should form. First glide on two feet. Transfer your weight to the foot you want to stand on as you glide. Lift up the other foot while gliding forward. Enjoy your time at the rink. Smile and laugh. 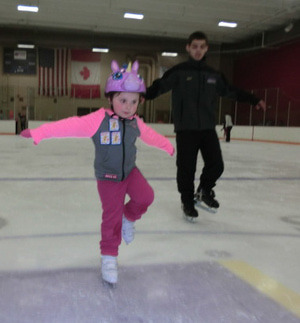 Once you practice the basics, play games on the ice or try to spin, skate backwards, or try to do forward or backward swizzles. next A Funny Figure Skating Memory: My Skating Partner's Wig Fell Off In Competition!